The border is a space cast in a constant barrage of terms, from predictable prepositions like across, before, after, over and between to interrogatories such as how, as in how in the hell did such a line in the sand come to be drawn? The artificial separation between two nations, the borderland of Las Cruces, New Mexico, is where Denise Chavéz made her entry into this world. The playwright, short story writer and novelist has been gifting us with her words for more than forty years, Denise Chavéz’s first work of fiction in 1995, Face of an Angel, won the American Book Award. Since that first novel, she has delivered three more books. The most recent, The King and Queen of Comezón, was published in 2014. In it, Chavéz opens the door for her readers, inviting them to visit the small, fictional town of Comezón. On its streets, in the homes of its residents or in the Mil Recuerdos Bar, Chavéz gives the reader an intimate look at the aspirations and failings of Comezón’s denizens. For Chavéz, Comezón also means an itch, a misplaced longing that can never be satisfied, and as readers, we feel her characters’ hunger and lust, their thirst for life, love and death. Chavéz’s words are not always easy to ingest, the pain lifts off the page and burns the soul. No matter. You want to bathe in her words, reading them over and over. What Chavéz delivers in prose is matched with her gift for creating irreverent and hilarious scenes that shake you to your core with laughter. 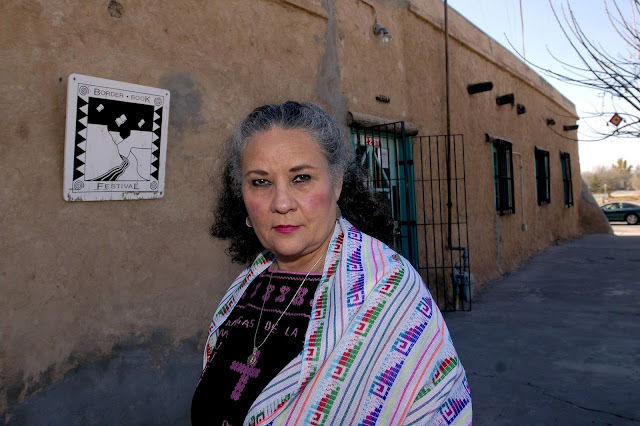 To stop with Chavéz’s litany of literary accomplishments, however, would dismiss what she has bequeathed to our community as La Primera Chingona, second to none, Chicana activist. Indeed, Chavez’s long-time activism was recognized yet again in 2016 when she was awarded the Paul Bartlett Ré Peace Prize for Lifetime Achievement by the University of New Mexico. For 20 years Denise Chavéz directed the Border Book Festival, and now, alongside her husband, Daniel Zolinsky, she is content to run the Casa Camino Real Bookstore and Art Gallery in her hometown. Denise is tireless, generously offering to mentor and promote the works of writers and artists. I sat down with her to ask about writing, community and the border—Maria Nieto. You were born in Las Cruces. How did your family get there? My mother’s family and my father’s family were very different in so many ways. It would take a lifetime to write about them. And I am. Both Los Chávez and Los Rede crossed the desert to find their way, respectively in southern New Mexico and Far West Texas. Chávez has its origins in the Spanish word llaves. What keys they were, who knows. I do know all Chávez in New Mexico are related and come from un tal Durán y Cháves who came over with the Oñate Expedition. They settled in a town called Los Chávez near Belén, New Mexico. I have never really studied the history of the Chávez in New Mexico, although it is recorded by Fray Angelico Chávez in his book, Origins of New Mexico Families. I always seem to know the other side, or underside of the official story, and that suits me as a writer. My father, E.E. Chávez was a brilliant lawyer, a terrible husband, an alcoholic, and a drinking partner of Fray Angélico. My mother’s family, Los Rede, lived in El Polvo, Texas, across the river from Ojinaga, México. My great-great grandfather, Francisco Rede, was given a land grant to settle in El Polvo. Later the name of the very small town was changed to Redford, for some Colonel Redford. When I was growing up there were maybe 50 people in El Polvo. The story in our family, and what family doesn’t have its legends and myths, is that Francisco was kidnapped by the Apache as a child, lived with them into adulthood, and then returned home. But he never forgot his indigenous ways, rising each morning to greet the sun on a nearby Cerrito. I am a mestizaje of my two families. I identify as a Mexicana/Mexican American/Chicana with raíces from here and there. I grew up as a Catholic, always have my Rosario with me, and have Sephardic Jewish roots from Delicias, México. I also have Jumano Apache blood. I am Buddhist in my outlook, and don’t know what I would do without Our Lady of Guadalupe watching my back. I have always loved learning. I wasn’t much of a student, although the perception is that I was a good student and a bookworm. Truthfully, I was a rebel daydreamer. School for the most part bored me, except when I had a good teacher, or worked on something that interested me. I brought books home dutifully, heavy and ponderous tomes they were, but I rarely studied. I would fall asleep with an open school book mashed near my head. I would copy poems by Langston Hughes or Edna St. Vincent Millay. This was before I discovered Neruda or Lorca. My most important training began when I got involved in theatre in high school. For many years, I was an actress. I still miss it sometimes, the immersion in character, the preparation and fulfillment of a role. I consider myself a performance writer. I wrote my first story when I was eight. It was about a willow tree in our yard. Later this story was rewritten when I was in my early twenties as “The Willow Game.” I have always seen this story as a pivotal turning point in my life of writing. My mother came outside our house to see our neighbor, Billy, pulling branches from our once beautiful willow. She asked what he was doing and he replied, “I’m killing your tree.” I was nearby, overheard, and didn’t understand. Or maybe I began to understand. He was a willful, mean and deranged teenager, but I didn’t know this or fully understand until later. I knew then he tormented his little brother and was a bully. We were afraid of him. Was there any one or a series of events in your early life that helped you along that path? Even though Delfina told me to not write about our family, she gave me my first thesaurus. I still use it today. In it she wrote, “To A Future Great Writer.” Her other advice to me, among many many consejos, most of them unrepeatable in polite company, was to “Write Just Gone with the Wind.” Margaret Mitchell wrote just that one great book. How do you decide on a subject and, once you’ve decided, how do you formulate a narrative structure? Also, what kind of an environment do you create for yourself to best allow that process to unfold on a computer or a page? The subjects aren’t the problem. I always have subjects. I often say that I’m booked for the rest of my life, and I am. The problem is often the narrative structure. I’m often reprimanded for being a “plot-less” writer. I am not sure what that means. If I did, I don’t think it would matter much anyway. I am a writer of character. And for me, plot comes out of character. My greatest role model in characterization is Anton Chekhov. Try Thomas Wolfe, Herman Hess, Dostoyevsky, the Greek playwrights, they are my teachers. Where did the idea for the Border Book Festival begin, what were some of the highlights, achievements, challenges? The Border Book Festival (BBF) was a grand 25-year experiment in creativity. Around 1995 I thought it would be good to bring writers and artists to Las Cruces. We didn’t have many multicultural artists coming our way. I called a meeting, but only one person really stepped forward, writer Susan Tweit. I became the Artistic Director and she became the Administrative Director of what we called The Border Book Festival. After three years, Susan moved to Colorado and I worked the festival for another 20-plus years. It’s my great honor and blessing to have worked with thousands of writers, storytellers, filmmakers, artists and audiences. I feel like that Replicant in the movie, Blade Runner, where he talks about seeing the miraculous on other planets. “I have seen things no one has seen. . .” Well, that’s how I feel. It was a wonderful lesson. I am now a bookseller at Casa Camino Real Bookstore and Art Gallery on the Camino Real in my hometown of Las Cruces. I sell books internationally on Abebooks. It’s a wonderful life to be a bookseller. It suits me magnificently. I am revising a novel I wrote during National Write A Novel in One Month, Nanowrimo, several years ago. I recommend this exercise to anyone who wants to write and to understand what it is to write. Participants write a 50,000 word novel during the month of November. It’s a labor of love, an obsession, and a grand fulfillment. It will teach anyone the experience of what it is to write full tilt. My novel is called City of Crosses. It is set in my hometown and is about the homeless and dispossessed people who live on La Frontera. The University of Oklahoma is interested in publishing the novel. The book cover was painted by Malaquías Montoya, the great Chicano artist. It’s a haunting and spirit-filled piece of art. It scares me and takes my breath away when I look at it and that’s good. The book is a series of heart stories reminiscent of Winesburg, Ohio by Sherwood Anderson, except set on La Frontera. It would make a good theatre piece. I am so honored to be working with Malaquías. We met in Mexico City during a conference and I knew I wanted to work with him then. The other novel, which is hanging there, suspended, in that torturous writer’s limbo, is called The Ghost of Esequiel Hernández, about the 18-year-old goat herder who was murdered by U.S. Marines in El Polvo, Texas. The soldiers, all young and Chicano, thought he was a drug runner and hunted him down wearing ghillie suits. One of the Marines shot him in cold blood. When I lived in Santa Fe some years ago, I was very sick with what I found out was walking pneumonia and I went to see a doctor who told me, after an EKG, that I had the Crud. The Crud? I was paying him to tell me I had the Crud!! “All you need is six months by a quiet lake,” were his parting words. Yes, I was in terrible shape with an unnamed, undefinable, and all too real illness, but somehow just seeing the doctor perked me up. I asked my then boyfriend, now husband, Daniel Zolinsky, to take me to the Sonic Drive-In to get some onion rings. I was alive, come what may. I often wish I had those six months and that quiet lake. I wish I could work fulltime on my writing. I do write every day and all times of the day and if I’m not writing, I’m thinking about my work, so I guess I am fulltime. Just don’t call me when my novela is on! I love being a bookseller and learning about writers and books that come randomly across my path and stick to my marrow like Rumanian poet Lucien Blaga, or Ramón Sender, the exiled writer who left Spain during the Spanish Civil War and taught classes at the University of New Mexico in the Spanish department.